I have recently discovered that my stock gauge failed. The previous owner has warned me that there is a kind of problem with it and that he tried fixing it and then gave up. When I picked it up, it worked okay, but after sitting in my garage for a couple of weeks it won't turn on anymore. I've got 2011 TRX680FA. And the problem is not with the wires (well, that's what I was told, then went and checked wires and they are really okay). 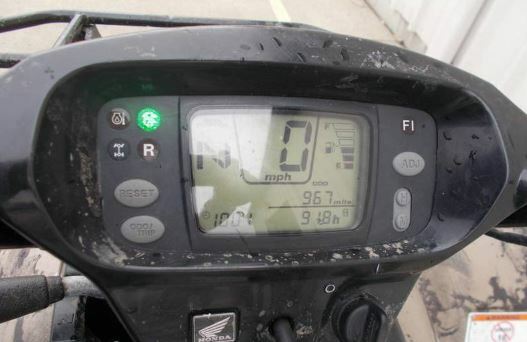 I thought of getting an aftermarket gauge, do you folks think it is a good idea? Just in case if there are different kinds of gauges for this model. Unless you design your own there is no "aftermarket" version. It is called a "Meter" by Honda, short for Speedometer! It would cost you around $290. I have seen them on here for much less, try also searching the wreckers, you might find one there as well. In order to be able to post messages on the Honda Rincon Forum : RinconRiders Honda Rincon Forums forums, you must first register.